Strength and flexibility training are beneficial for all athletic horses regardless of the type of activity or sport they participate in. This article describes how dynamic mobilization exercises, also known as baited stretches or carrot stretches, activate and strengthen the muscles that round and bend the horse’s neck and back. The exercises are a form of cross training, which emphasizes the use of a variety of different types of exercise to improve the horse’s overall fitness and soundness. By incorporating a variety of types of exercises in the training program, the horse develops a wider range of athletic skills with less risk of developing repetitive use injuries as a consequence of repeatedly performing the same type of exercise or movement. Regular performance of dynamic mobilization exercises will result in improvements in the horse’s posture and ability to carry the rider in a rounded outline. What are dynamic mobilization exercises? Dynamic mobilization exercises are also known as baited stretches or carrot stretches. They are performed from the ground (unmounted) and involve teaching the horse to follow a food treat (bait) or track a target with his chin while keeping his feet stationary. Specific muscles are activated in order to move and stabilize the intervertebral joints as the horse moves his chin into the different positions. The abdominal muscles help to round and bend the back, while the back muscles provide a counter-torque that stabilizes the intervertebral joints during back movements. Joint stabilization is very important both for improving athletic performance and for preventing back injury. Research has shown that regular performance of dynamic mobilization exercises over a period of 3 months stimulated hypertrophy (enlargement) of the muscles that stabilize the horse’s back. This research was published as Dynamic mobilisation exercises increase cross sectional area of musculus multifidusin the prestigious Equine Veterinary Journal in 2011 . Are dynamic mobilization exercises safe for my horse? Dynamic mobilization exercises are generally safe for any horse to perform, but if your horse has a history of a serious musculoskeletal injury or neurological disease your veterinarian should be consulted before starting to use the exercises. The effects can be very beneficial during rehabilitation, but it is important to wait until the appropriate stage of the healing and recovery process before starting to use them. You don’t need any expensive or sophisticated equipment to perform dynamic mobilization exercises. Carrots cut into strips about 1/2 inch (1 cm) in diameter work well as a bait. However, it is important to protect your fingers with gloves, preferably made of leather. In addition, you can make a simple finger protector from a piece of plastic, such as the lid of a coffee can with an X cut in the center to allow the bait to pass through. As an alternative to using a bait, you can teach the horse to perform the exercises using target training. The horse is taught to follow movements of the bait or target with his chin. When the desired position is reached, it should ideally be held for a few seconds. Work in an enclosed area on a level, non-slip surface, such as an arena, round pen, paddock, or large, well-bedded stall. Most horses are more flexible on one side than the other. The athletic horse should be equally flexible and powerful on both sides. Use these dynamic mobilization exercises to equalize the flexibility on both sides of your horse. In the beginning, it is helpful to back the horse into a corner or stand him against a wall until he learns to follow the bait with his chin rather than by moving his legs. Start each exercise with the horse standing in a balanced position. Often, horses adjust their position during the exercises to maintain their balance, especially in the learning stage, so stand in a safe place relative to the horse, and give yourself room to step away from the horse if necessary. 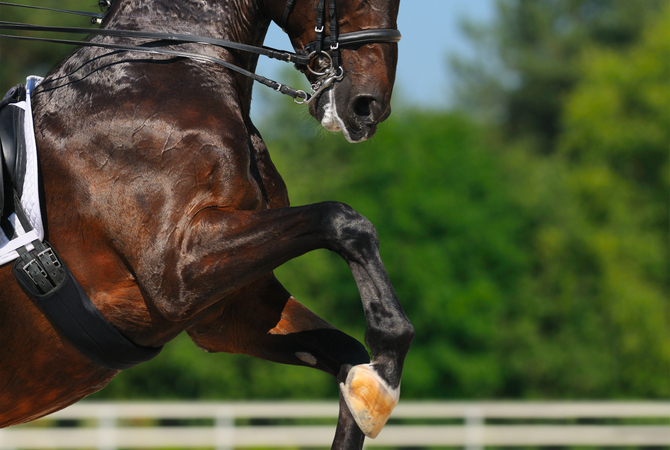 Be observant of the horse’s head position, body posture, and reactions as you perform the exercises. Chin between fetlocks: Further stretches and flexes thoracic region beneath the saddle area and strengthens neck, abdominal and back muscles. Chin to girth: Creates lateral (side-to-side) flexibility for the neck and strengthens neck muscles. Chin to flank: Further stretches and improves flexibility for the neck and base of the neck, including outside shoulder and strengthens neck, abdominal and back muscles. Chin to rear fetlock: Creates improved lateral flexibility extending to the barrel of the horse and strengthens neck, oblique abdominal, back and pelvic stabilizer muscles. Dynamic mobilization exercises are performed in spinal flexion and in spinal lateral bending. For the group of exercises that flex or round the horse’s neck and back, it is important for the chin to stay aligned with the middle of the horse’s body and not to allow the horse to tilt his head which is shown by having one ear higher than the other. Each exercise flexes specific areas of the neck and back. Chin-to-chest maximally flexes the poll area, whereas chin-between-knees and chin-between-fetlocks extends the poll while flexing the joints at the base of the neck and in the thoracic region in the area underneath the saddle. The hind fetlock on each side. The bait should be held one to two feet away from the side of the horse’s body to encourage the neck to bend along its entire length rather than forming a hinge just in front of the shoulders. Try to keep the ears at the same height so the horse is truly bending rather than twisting his neck. Most horses will initially perform this exercise a little differently to the left and right sides but may become more symmetrical with practice. When you are teaching a horse to perform the exercises, be content with a small amount of movement in the required direction. Over time, ask the horse to reach a little further until achieving the desired position or reaching the end of the range of motion. Try to maintain each position for several seconds then allow the muscles to relax after each attempt. Repeat each rounding exercise 3-5 times daily, and do 3-5 repetitions to each side for the lateral bending exercises. Unlike passive stretching exercises, dynamic mobilization exercises allow the horse to control the amount of motion and he is never forced into an uncomfortable position by manual pressure. Consequently, these exercises are very safe and do not carry a risk of over-stretching. Furthermore, it is safe to use them before exercise to activate the core musculature in preparation for the activities that will follow. Dynamic mobilization exercises and other core training techniques for horses are described in a 95 minute DVD and accompanying booklet called ACTIVATE YOUR HORSE’S CORE that is available: www.SportHorsePublications.com. Prof. Hilary Clayton, BVMS, PhD, MRCVS, Dipl ACVSMR graduated as a veterinarian and worked in mixed practice before becoming returning to academia to complete a PhD. She held academic appointments in Great Britain, The Netherlands and Canada before moving to the US in 1997 as the first incumbent of the Mary Anne McPhail Dressage Chair in Equine Sports Medicine at Michigan State University. Prof. Clayton’s research is in the areas of equine sports medicine, especially biomechanics, conditioning sport horses, and the rider-horse interaction. Recently, her research has focussed on providing evidence-based research on the effects of physiotherapeutic techniques in horses. She has published six books and over 200 peer-reviewed manuscripts. Prof. Clayton is a charter diplomate and President-Elect of the American College of Veterinary Sports Medicine and Rehabilitation. She has been awarded the Norden Distinguished Teacher Award, has been inducted into the International Equine Veterinarians Hall of Fame, the Saskatchewan Sports Hall of Fame and the Midwest Dressage Association Hall of Fame, and is an Honorary Fellow of the International Society for Equitation Science. In her spare time she trains and competes dressage horses. She has earned USDF bronze, silver and gold medals riding horses she trained herself.